We had plans to see Princess Bride at Dolores Park movie night last week, so I made some snacks. 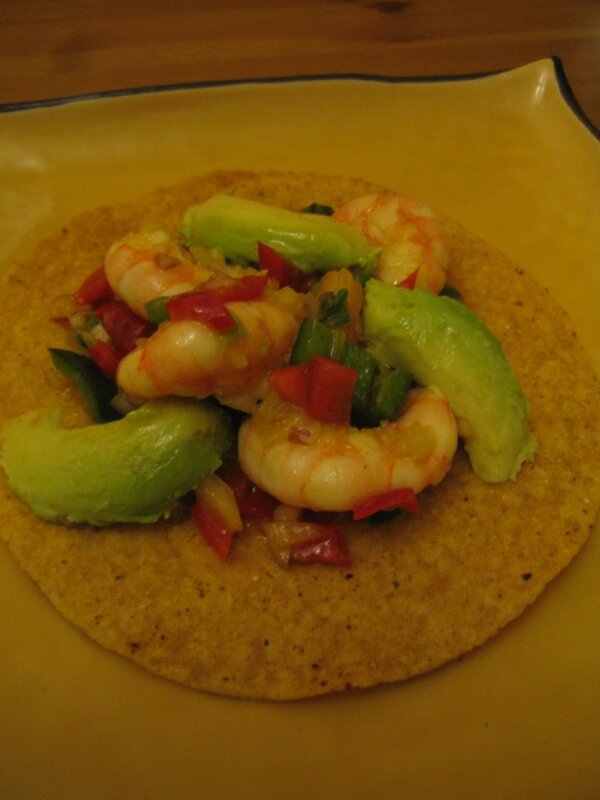 My tostadas de camarones were inspired by Señora Salomón's camarones a la vinagreta. Whenever we visit Chicago we are always greeted with hugs and camarones a la vinagreta. 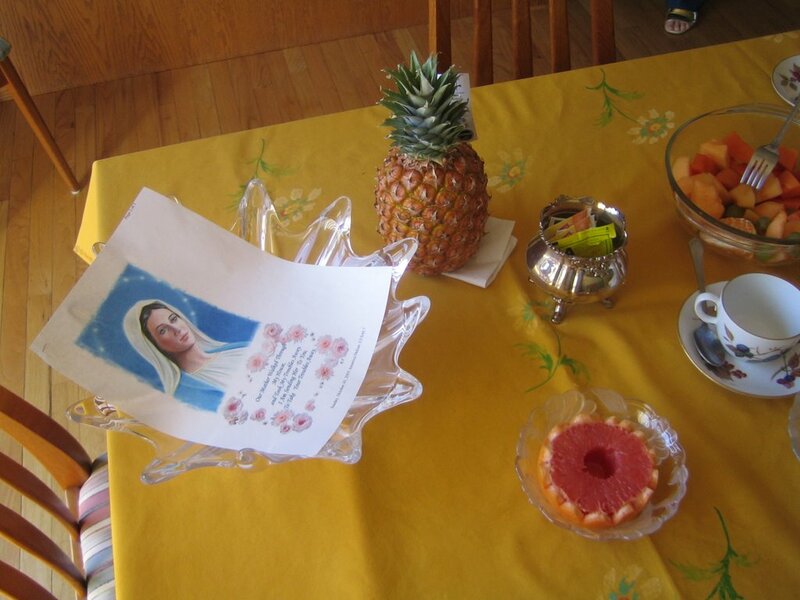 Also, Señora Salomón always has fresh fruit salad on hand because she knows it is my favorite. So for the outdoor movie I decided to prepare a picnic basket with fruit salad and something similar to camarones a la vinagreta. Señora Salomón gave us an old school Dominican cookbook and there is a recipe for camarones a la vinagreta. But I wanted to try out an idea I read in an old magazine at the dentist office, camarones al mojo. Mojo, not mojo is a Caribbean garlic citrus sauce that can be used as a marinade, dipping sauce, or condiment. 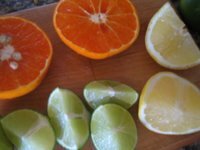 Mojo is often made with Seville oranges. I made a reduction of honey tangerine, lime, and lemon juices. 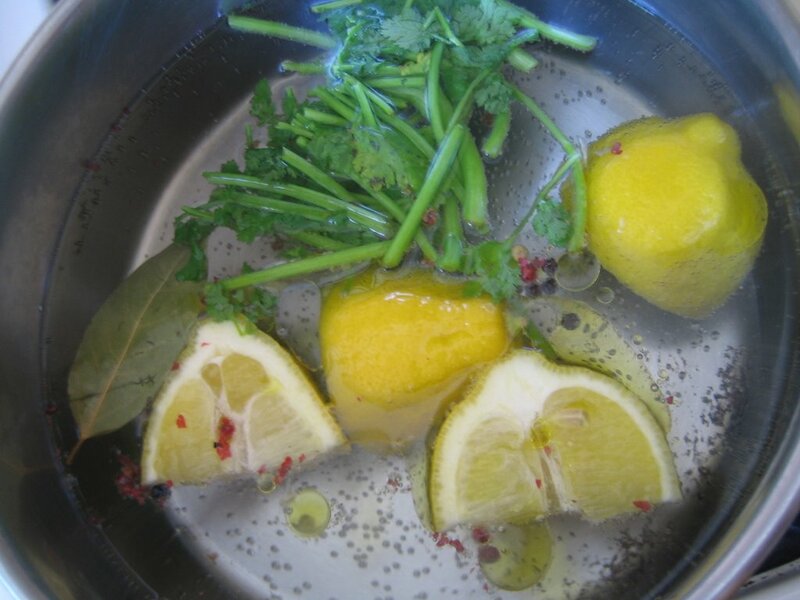 I combined the fresh concentrated juice with olive oil and garlic for the marinade. The acid in camarones al mojo comes from citrus rather than vinager. The shrimp is poached in water with a bay leaf, cilantro stems, black pepper, salt, and a lemon. Then I chop up a white onion, one poblano chile, and a red bell pepper. 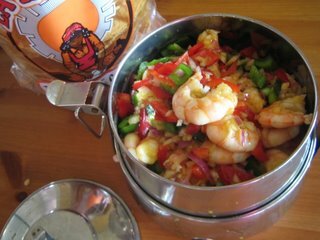 The vegetables marinate along with the poached shrimp for 8 hours. I decided to serve the camarones al mojo with tostadas because they could work as forks and plates and the crunchy corn flavor is a classic companion like in Mexican coctel de camarón. 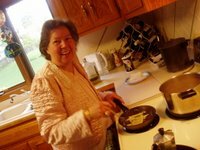 All I needed to do was fill the tiffin box with the camarones al mojo and pack the tostadas along with some avocados, spoons, and the fruit salad. Then I carried the packed meal like a dabawalla to the park. Surely, someone at the park would provide the wine or beer in exchange for some tostadas de camaones al mojo. Before I packed the picnic basket, I had to snack on one at home. Lave los camarones. 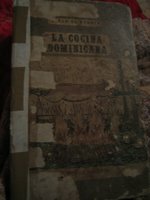 Ponga al fuego el agua, con todos los ingredientes. Cuando rompa el hervor, baje el fuego, tápelos déjelos por 20 minutos. Bájelos del fuego y deje enfriar los camarones en su agua. Pélelos cuidadosamente. Quiteles la linea negra que corre a lo largo del cuerpo de los camarones. Mezcle sal, vinagre, aceite, salsa inglesa, pimienta o Tabasco, y pimentón. Reserve. En molde de cristal con tapa vaya colocando una camada de camarones, alternando con el resto de ingredientes hasta termina con todos. Vierte por encima la mezcla de aceite y vinagre. Lleve a la nevera y deje por 8 horas, para servir bien frío. You can find different types of mint at the farmer's market this summer, like pineapple mint, peppermint, or spearmint to jazz up your mojito. Crush mint with some demarera sugar and ice in a funky gimlet and add Brugal rum and soda water. For your sweet tooth, TDP recomends a chocolate mojito parfait with rum soaket chocolate chiffon cake, mint mousse, cocoa nib whip cream, lime mirroir and chocolate chips, and mint mirroir. 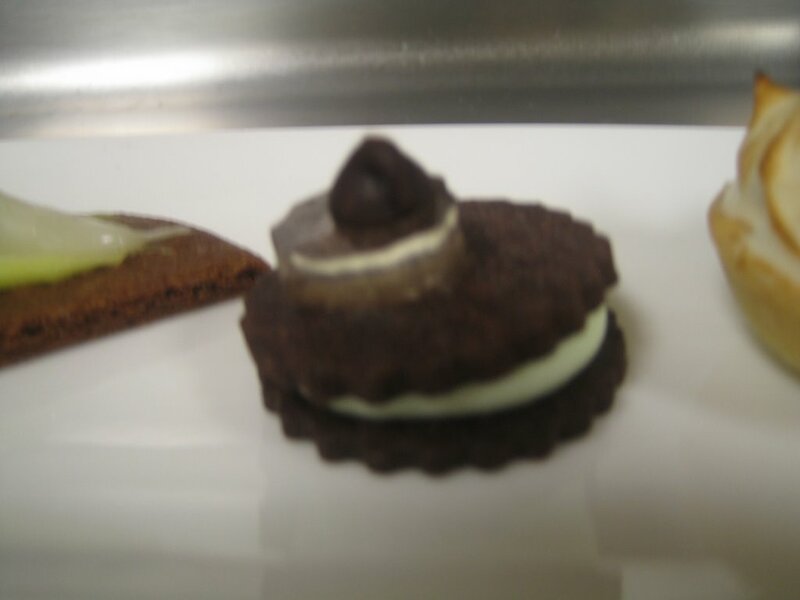 Or a chocolate mojito sandwich cookie. Also try the "Rocapulco parfait", a piña colada arroz con leche cup of dreams. 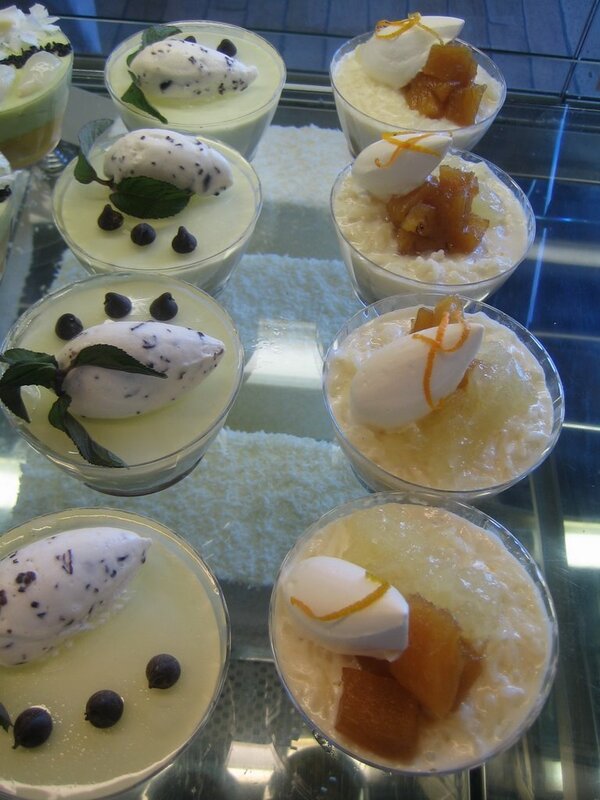 Pound cake soaked with Malibu rum and lime topped with coconut arroz con leche and topped with poached pineapple.